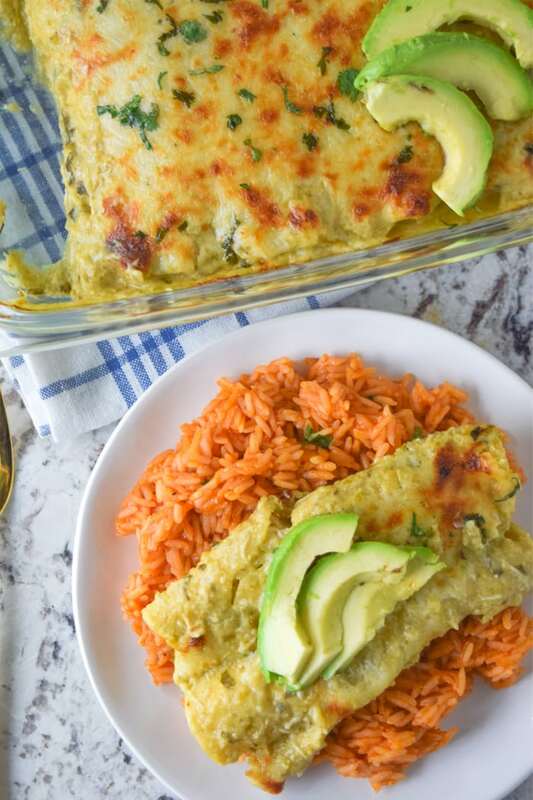 Roasted Tomatillo Chicken Enchiladas covered in a luscious sauce and baked to cheesy perfection. This super easy recipe will keep you coming back for more! 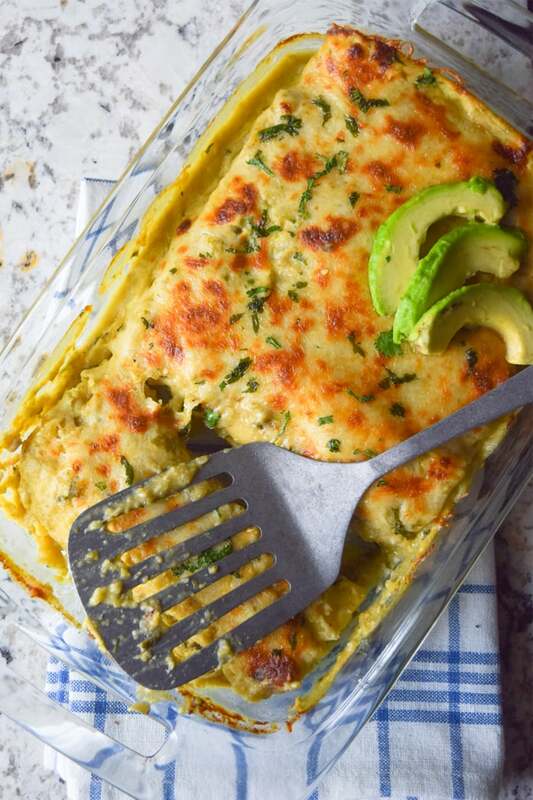 If for some reason, somebody told me that I was only allowed to eat these Roasted Tomatillo Chicken Enchiladas every single day for the rest of my life, I don’t think I would complain too much. Does that put into perspective just how much I love these things? 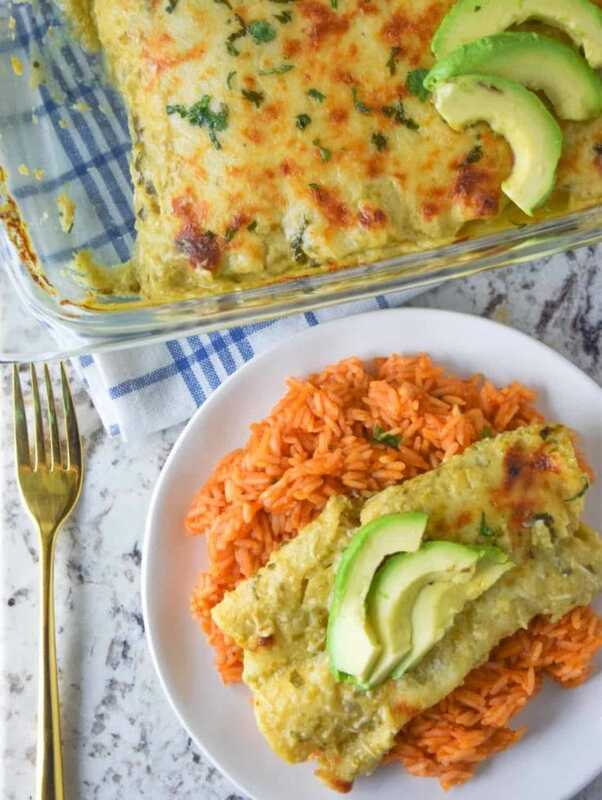 They’re homemade enchiladas that are sure to impress your friends and family, and will definitely keep you coming back for a second serving! Hello! 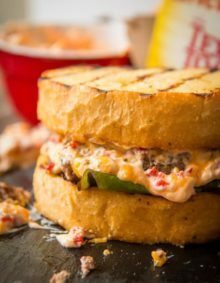 My name is Brenda from The Peppery Skillet, and I am so thrilled to be here sharing this recipe with you today! If you follow me on Instagram or Facebook, you can tell that I really love comfort food. 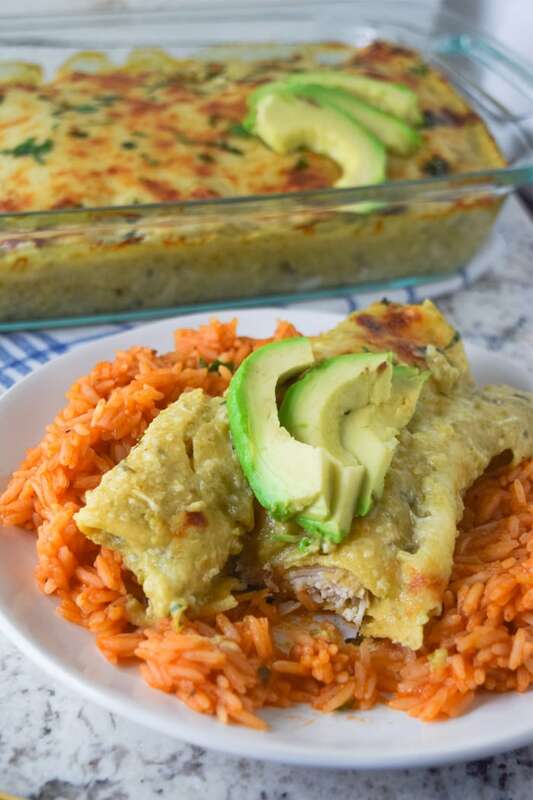 These Chicken Enchiladas are the perfect canvas for the cheesy and comforting tomatillo sauce. Don’t just take my word for it— let’s dive into these enchiladas and make ‘em together! Step number one with these enchiladas is to roast the veggies, because they’re going to be blended into a hot, smoky sauce. By roasting them, you get an amazing char on them, and that is going to add more flavor to your meal. 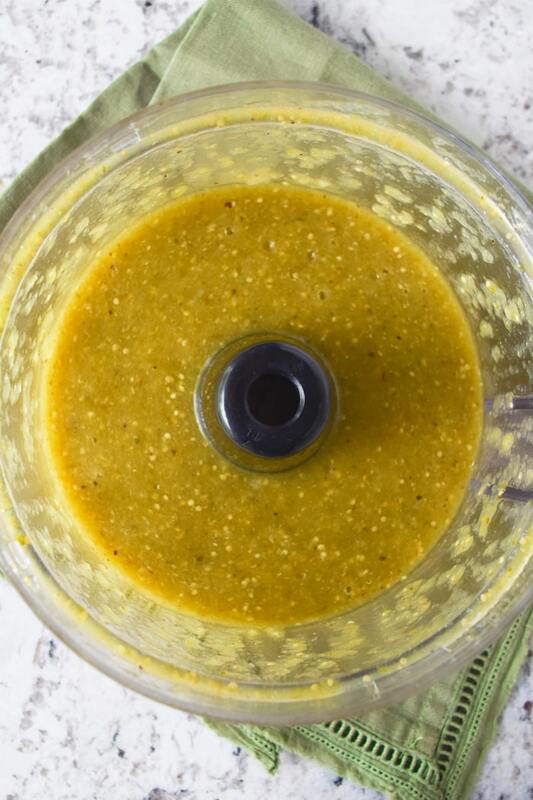 My favorite part about this sauce is that the base is only two steps: char and blend. Later, you’ll be adding other ingredients into the mix, but it doesn’t get too much harder than that. Once your charred vegetables are blended, you’ll add a small portion to a bowl with your shredded chicken and cheese, then the rest of the sauce will go into a warm skillet with some chicken broth. When it’s in the skillet, and after you add the sour cream and some shredded cheese, you will have an overwhelming desire to stick your hands into the sauce— but don’t do it! Save it for the enchiladas! We’re almost finished. Grab a small skillet and add about ½ cup of vegetable oil and warm it over medium heat. Place them on a paper towel lined plate to get rid of the excess oil. By quickly submerging the tortillas, or by briefly dipping them in the warm tomatillo sauce, they soften and are easier to roll. I like a lot of filling in my enchiladas, so I use about two heaping tablespoons of shredded chicken and cheese mixture. I always add a lot of cheese in my enchiladas, but I wanted to be reasonable on my ingredient list. I’m never going to say you can’t add more cheese than a recipe asks for. Do what makes your heart happy! 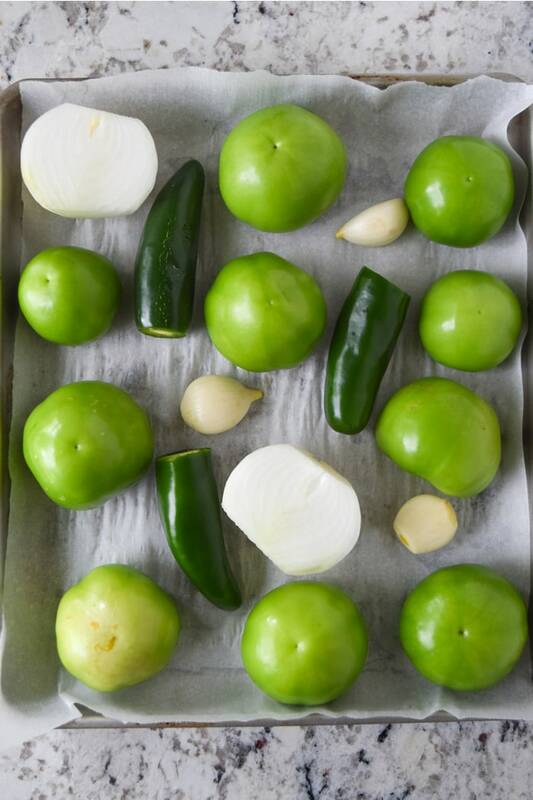 Once they’re all rolled up, place them in an oven-safe baking dish and pour alllll of the luscious roasted tomatillo sauce on top. It’ll melt between the enchiladas, and may even find its way inside. Sprinkle more cheese over the top, then bake them until the cheese is melted and the sauce is bubbly. Beautiful things happen when they’re in the oven, I’ll tell you that much! I’m so passionate about these Roasted Tomatillo Chicken Enchiladas, and I will profess my love for many months to come. I hope this becomes a weekly staple meal in your household. Show these enchiladas some love and tag #thepepperyskillet and #ohsweetbasil in your photos of this delicious meal! Thanks for being here and I hope these enchiladas make all your dreams come true! 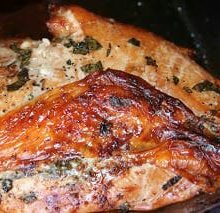 Preheat oven to 400 degrees and line a baking sheet with parchment paper or aluminum foil. 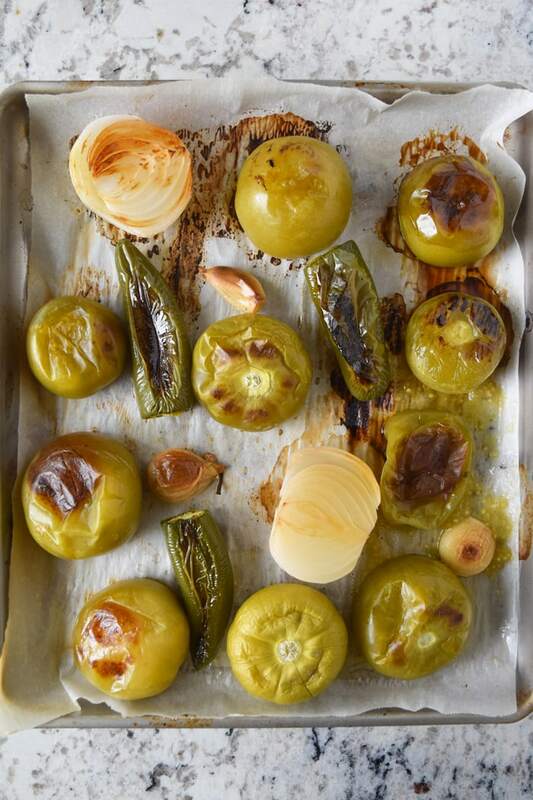 Roast tomatillos, jalapeños, onion and garlic cloves for 30 minutes, flipping midway to avoid excessive charring. Remove from oven and let it cool for 10 minutes. Add roasted ingredients to a food processor with cilantro and spices, and blend until smooth. Add salt and pepper to taste. Reserve 1/2 cup of sauce. Pour the remaining sauce and chicken broth into a large skillet over medium heat. Allow to simmer for 3 minutes. Add shredded cheese and sour cream, and mix well until combined, allowing to simmer for an additional 3 minutes. Remove from heat and set aside. Lower oven temperature to 350 degrees. In a small skillet, add vegetable oil over medium heat. Once warmed, add one tortilla at a time, leaving submerged for 5-7 seconds. Remove and place on a paper towel-lined plate. In a large bowl, combine shredded chicken, 1 cup shredded cheese, and reserved 1/2 cup tomatillo sauce. Add two heaping tablespoons of the mixture to each tortilla, and tightly wrap them and place each in a 9 x 13 baking dish, seam side down. 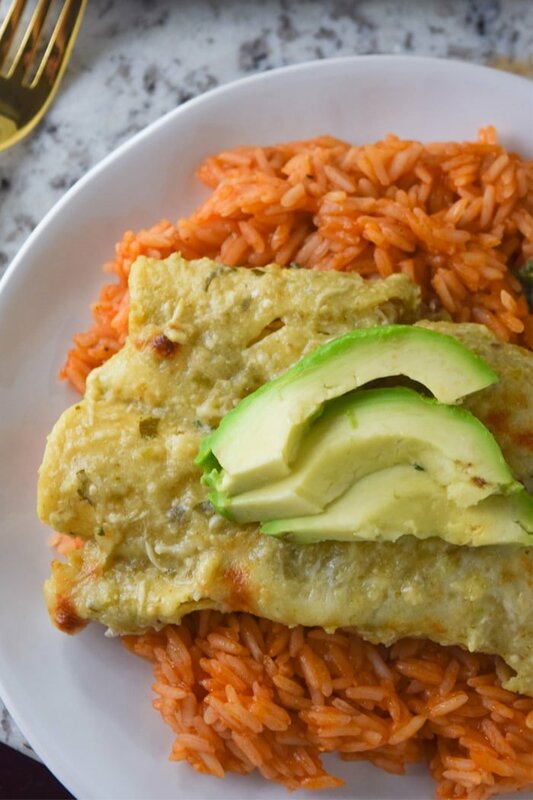 Once all enchiladas are wrapped tightly, pour the roasted tomatillo sauce over the prepared baking dish. 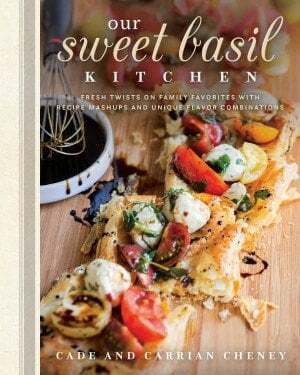 Sprinkle with remaining 1 cup of shredded cheese and bake for 10-12 minutes, or until cheese is melted and bubbly. Remove from oven and enjoy immediately. If you’re on the hunt for other delicious recipe ideas, you should try this Chorizo Dip Queso Fundido. You can also check out this family favorite, Slow Cooker Shredded Mexican Chicken. 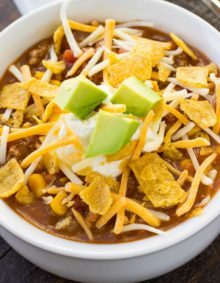 It can feed a crowd and it’s versatile — my favorite way to enjoy it is on top of some nachos! And there’s these Baked Chicken Chimichangas that are so yummy! How about plain greek yogurt? Or if that is still too close to sour cream, I would go with cream cheese! Hi Crystal! I’m afraid if you make the enchiladas a day ahead of time, the corn tortillas will get soggy. You could definitely make the filling ahead of time and then fill and roll the enchiladas the day you make them. You can soften your corn tortillas in a tortilla softener made of cloth, found at grocery stores. This way you will avoid the extra oil and calories. Your tortillas will be very pliable and easy to roll.